Erik Matti's slow burn crime thriller offers a tantalising glimpse of the class struggles and high-level corruption in modern day Philippines, punctuated by taut action beats and a parade of tough, impressive performances. Apparently based on true events, On The Job follows a variety of players in a multi-faceted assassination racket that sees incarcerated prisoners secretly pulled out of jail, to be used as hit men for corrupt government officials. For the trigger men, the job offers a healthy payday and frequent opportunities to visit their loved ones or savour other fruits of the free world. For the high-ranking members of the government and military, it's an easily contained operation with no shortage of willing, easy-to-control candidates. For the cops, however, it proves increasingly difficult to track down and arrest their suspects, all of whom have the perfect alibi of being already behind bars. Investigating the case are a mismatched pair of law enforcers - hot shot district attorney Francis Coronel (Piolo Pascual) and down at the heelsd street cop, Sgt. Acosta (Joey Marquez). Their prime suspect is General Pacheco (Leo Martinez), whose bid for senator has been hugely assisted by a series of high profile assassinations. Complicating matters, Coronel's father-in-law, is also Pacheco's running mate, wealthy businessman and official, Manrique (Michael de Mesa). 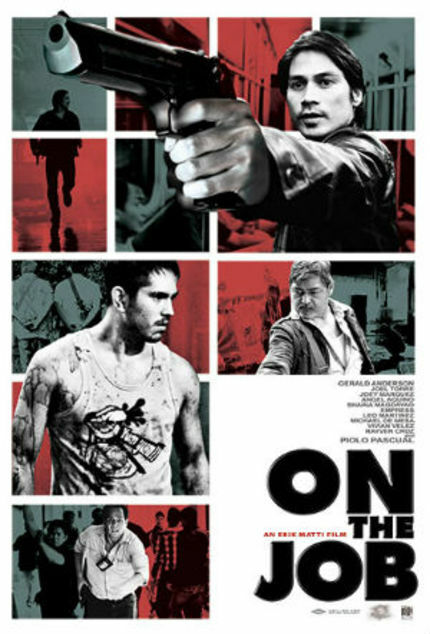 At the opposite end of the equation is Tatang (Joel Torre), a long-serving prisoner at a squalid, overpopulated penitentiary, who has worked his way up to being Pacheco's go-to gunman. Tatang is also grooming the cocksure Daniel (Gerald Anderson) as his apprentice, and the promise of money, better conditions and frequent tastes of freedom sees the youngster chomping at the bit for more trigger time. Erik Matti, who also wrote the screenplay together with Yamamoto Michiko, takes his time developing these characters, exploring their particular values and ambitions, their attitudes towards personal gain, human life, money, power and survival. The first hour of the film shows us Tatang's desperate family situation - a wife and adult daughter eking out a living in Manila's vast slum district. This plays in stark contrast to the lavish lifestyle of Pacheco and Manrique, whose empire built on exploiting exactly these kinds of people, sees them living like kings in a unrecognisable version of the same city. Inevitably the fruits of their nefarious labours have trickled down to Francis and his beautiful wife, Nicky (Shaina Magdayao), but he remains determined to use his position for good, rather than follow in the footsteps of his father-in-law, or as we discover, his own father. In the second half the film explodes in a series of compounding murders, betrayals and revelations that begins with an incredibly tense set piece in a busy city hospital. After that the pace refuses to let up, and On The Job dives headlong into a world governed by violence and fueled by the quest for power. The result is a genre film of exceptionally high quality, the likes of which have rarely, if ever, emerged from The Philippines before now. The cast is uniformly excellent, with the film's three male leads all in top form. Pascual is excellent as the idealistic attorney willing to go toe to toe with the Powers That Be in order to see justice prevail. Anderson is cocky and greedy without ever becoming unsympathetic, but it is Joel Torre who truly shines. Tatang is a ruthless, determined killer, but also a deeply loyal patriarch desperate to provide for his family whatever the cost. He is the man with the dirtiest hands of all, but manages to make his campaign genuinely feel like the right thing to do. Wonderfully moody cinematography (from Francis Ricardo Buhay III) combines with an excellent soundtrack and some breathlessly tight editing to create a surprisingly dark and nihilistic film. At times, the aesthetic of On The Job feels as though Michael Mann or Johnnie To were stripped of their high-end toys and dragged through the mud and squalor. Erik Matti's style is powerful, deliberate and unforgiving, yet also displays a heartbroken social conscience about the state of his home nation. On The Job may demand patience from its audience as it builds its layered and expertly rendered world, but rewards them with a third act that unflinchingly depicts the brutality of human survival. Review originally published in slightly different form during PiFan in July 2013. The film opens in select theaters in the U.S. on Friday, September 27. Visit the official site for more information.